Better Portable Graphics (BPG) is a relatively new image format (it was first released in 2014) and for the time being the support for it is scarce. No mainstream browser supports BPG images and there are just few viewers which can open BPG files. Although compression-wise BPG is superior to other graphic formats without mainstream support this format will not gain popularity. 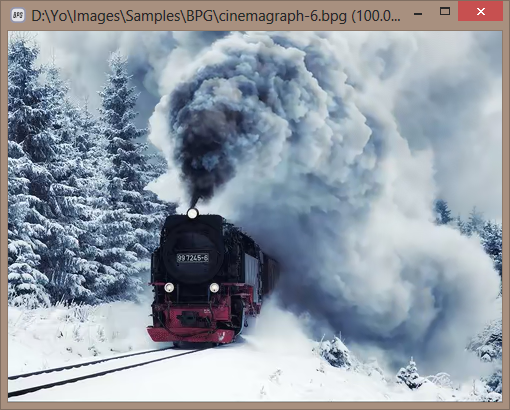 Recently I came upon a BPG viewer which happened to be both cross-platform (available for Windows, Linux and macOS) and portable- Simple BPG Image viewer, it is really a very simple and light, keyboard-driven viewer. 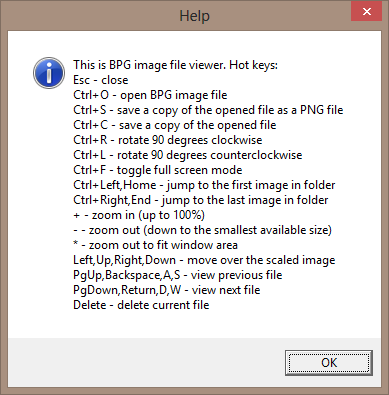 This program allows you to view BPG Images. The portable version of Simple BPG Image viewer is really portable and stealth- it does not save any settings, it does not write to AppData and Windows registry. Simple BPG Image viewer should run on Windows 7 or higher. Simple BPG Image viewer is licensed under BSD 2-Clause "Simplified" License. Simple BPG Image viewer is written in Python. Simple BPG Image viewer is not fat- the x32 version is 8.27 MB uncompressed, the x64 version is 11.0 MB uncompressed. Simple BPG Image viewer is not heavy- the x32 version uses about 38 MB of RAM, the x64 version uses about 50 MB of RAM (under Windows 8 x64). The developer of Simple BPG Image viewer- Alexey Simbarsky, is helpful, friendly and open to suggestions- two of my ideas were implemented within a day. It seems that Simple BPG Image viewer (as of version 1.25) does not support animated BPG images. BPGviewer is most likely abandoned (it writes Trolltech junk keys to Windows registry) and it crashed while I was testing it. BPGconv worked fine for me. Simple BPG Image viewer at version 1.26, now it supports On Top and Animated BPG Images. Now all the suggestions I made are implemented and some of them were done within a day after I opened an issue, the developer- Alexey Simbarsky, simply amazed me with his astounding responsiveness and incredible speed. Thank you, Alexey! The program has improved a lot within 3 days and 2 releases. The image I made does not look smooth- I had to make a shorter record because the PNG file became very big (over 25 MB) and the hosting service rejected it. 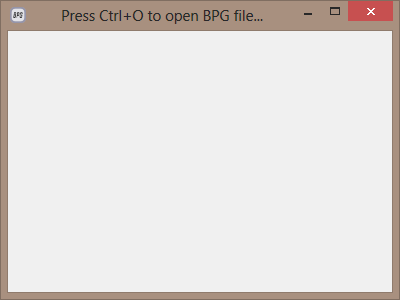 BPGconv fails to convert animated PNG (APNG) to BPG- it converts only the first frame on an animated image. I see, so that image isn't really an animated BPG, but in fact a APNG -- the subtle detail eluded me right off. And as a rule of thumb most image tools are ill-suited to deal with animated formats (e.g., PNGoo does the same to APNGs). The animated image seen in Simple BPG Image viewer is BPG file (you can download the file or see more examples), the screen showing Simple BPG Image viewer playing the BPG file is PNG (APNG). Even if I could save the animated image I created in BPG format it wouldn't play in browsers since as far as I know no browser supports BPG format. Without browsers support BPG won't gain popularity.